Today I met with some friends for lunch at the Sydney Fish Markets. A true Sydney institution, it ranks as the second largest fish markets in terms of variety in the world, thereby reflecting Australia’s status as a leading seafood nation. 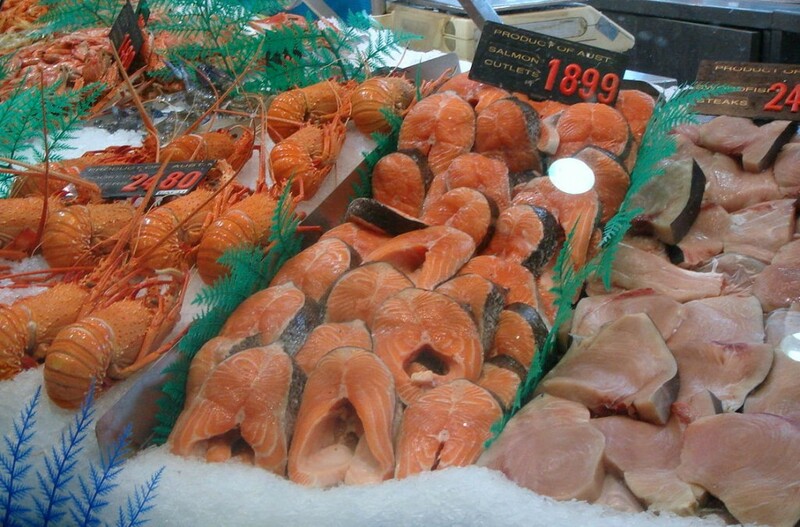 The largest wholesale fish and seafood market in the world is the fish market in Tokyo, the Tsukiji. I love the Sydney Fish Markets. It was an integral part of my childhood as my father was quite strict about eating only fresh seafood. 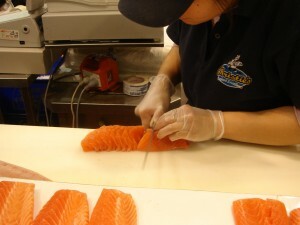 No fish was ever eaten from being refrigerated overnight, only if purchased fresh on the day. So as we ate fish about three to four times a week, this would entail quite regular visits to the Sydney Fish Markets. 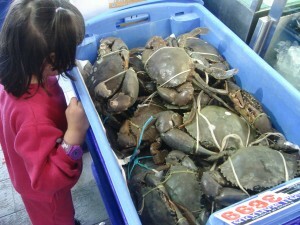 Especially popular in my household were those occasions when we would buy live mud crabs which my father would then stir-fry with chilli, ginger, garlic, spring onions and all things nice. Nostalgia aside, I also love the Sydney Fish Markets because it truly has a wonderful array of fresh seafood to choose from. 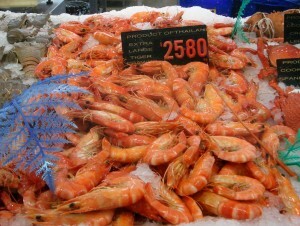 The Sydney Fish Markets open daily from 7am to about 5pm, and being so accessible, there have been many times when I have gone to the Sydney Fish Markets to purchase fish, prawns and lobsters, sometimes for barbequing in the backyard. Invariably I would have also been unable to resist buying some freshly shucked oysters which I would have snacked on whilst waiting for the food to cook. If I was to come up with a list of some of the things I miss most about Sydney this would rate as one of them, both on its own merits and the fact that there isn’t anything similar which is this readily available, with these sorts of opening hours, to the public in London. 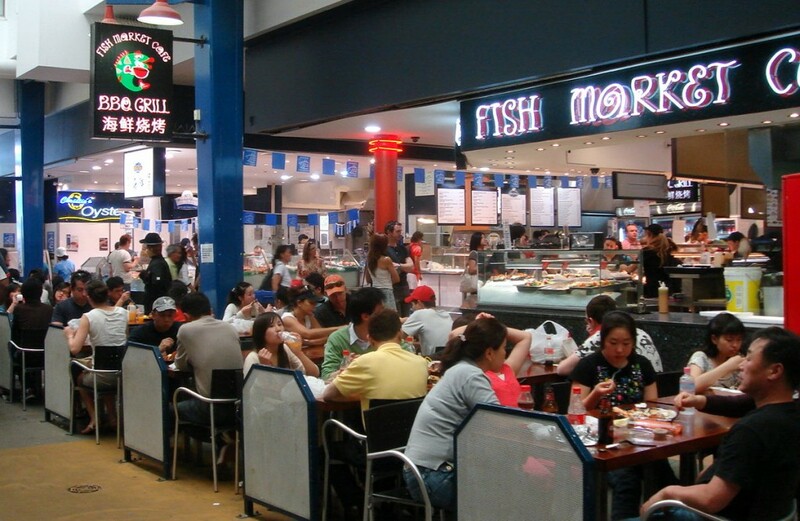 For lunching or snacking purposes, the Sydney Fish Markets also sells freshly cooked seafood. There are also ‘choose your own sashimi’ counters where you can select the fish you want and have it cut on the spot for you. Today we had salmon sashimi ($40 a kilo), oysters (ranging from $10 to $15 for a dozen), grilled seafood skewers ($3.50) and calamari and chips (A$10). We sat in the park nearby. It was 30c degrees today, unseasonably warm for the beginning of spring in Sydney. However, we were in the shade and there was a really pleasant, gentle breeze which ensured maximum comfort for lying on the grass and seemed to encourage one to occasionally doze off. With yummy seafood accompanied by cider and bad, silly jokes it turned out to be a really lovely afternoon. Tip: Most seafood vendors at the Sydney Fish Markets will allow you to sample the cooked prawns for free (but unfortunately not the oysters), even peeling them for you. Eat away!